Since its founding in 1990, Reston Limousine has grown to be the largest private limousine and shuttle service in the Washington DC region, the largest transportation service in Virginia, and one of the largest in North America. Reston Limousine is a woman-owned business providing transportation service to a diverse array of clients in the Washington D.C. metropolitan area. We understand the importance of timely, reliable service and offer solutions for any of your transportation needs for groups of all sizes. We have an outstanding reputation with both government and private industry and providing reliable shuttle service is the foundation of our company. Reston Limousine offers the best value for committed, reliable transportation services and as the largest service in the DC area, we offer the greatest flexibility for equipment options and capabilities. We have provided quality service to the Social Security Administration, U.S. Geological Survey, Department of Justice, Department of Homeland Security, Fannie Mae, Federal Deposit Insurance Corporation, Federal Reserve Board, and many more! Reston Limousine is pleased to offer GSA services for our federal clients. 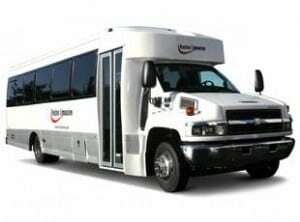 As a vendor providing Ground Passenger Transportation Services pursuant to SIN 411-1, Reston Limousine provides reliable, safe and efficient shuttle bus and charter services. The size of Reston Limousine is in the top 1% of the industry. Dedicated Safety and Risk Manager. Received the highest ranking for a Department of Transportation (DOT) audit in 2009. New Fleet. The majority of vehicles are under 3 years old. Full service garage and detail shop on site. 24/7 live call center, staffed by our own employees. Extra vehicles in our fleet for trouble shooting. Utilizing all the latest technology for safety and service level management. Award the Public Service Convenience Award (1999) by the United States Department of Veterans Affairs. Need more information? Call our Sales Department at 703-478-0500 option 1, or fill out the contact form below.